The 400-shape group has come to the forefront with Peterson’s recent reboot of the 406 “Large Prince” (seen above). It’s an interesting and usually overlooked group, comprised of straight shapes influenced by the classic English chart. Insofar as the catalogs are concerned (which are never, of course, identical with actual production dates), the shape group begins quite understandably shortly after Peterson opened its London factory in the Bradley Buildings in 1937—England at the time being one of Peterson’s “Big Three” markets (the other two being the US and Germany). As a group, the shapes reflect the smoking styles of the mid-twentieth century—the 1940s, 50s and 60s—the decades that produced most of them. 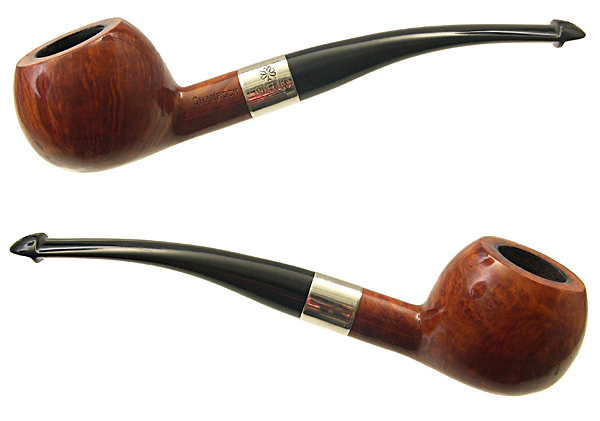 That is, they are smaller pipes than most pipemen (and women) use today and they’re lighter, designed for the comfort of constant clenching in an office or factory environment where both hands were needed, and for the shorter, probably more frequent smokes that the interruptions of the workday entails. While I’ve been able to document 21 shapes, probably no more than 8 to 10 were ever offered at one time, and for most decades considerably less. 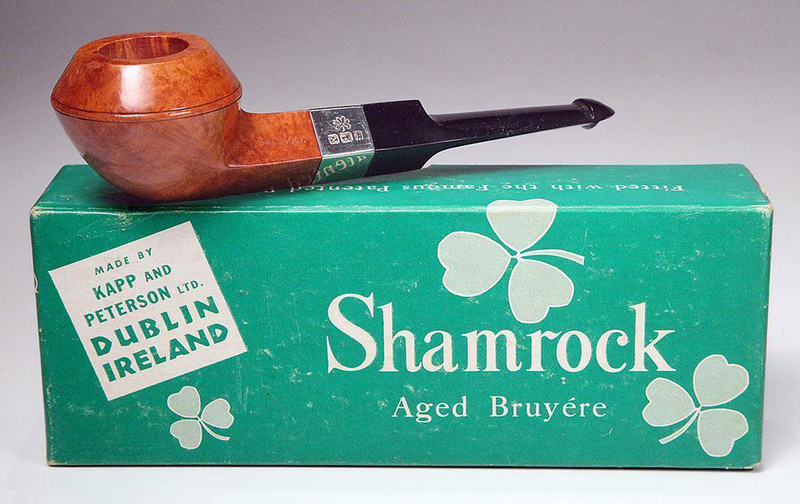 Once in a while Peterson, being the counter-cultural wags they are, will subvert the English aesthetic by giving a shape a “bit of the Irish,” adding what they call an “S/B” or “Semi-Bent” mouthpiece—a piece of Peterson lore that even Peterson has forgotten! The 400 is about as English as a billiard can get, although perhaps a little beefier than we’re accustomed to think of today. It is seen only in the 1937 catalog. The photograph below isof an over-reamed estate (with a replacement stem), made quite fittingly at the London factory. The 405s was first announced in the 1979 update to the 1975 catalog and released in the various Classic Range lines, documented in the Kildare, Kildare Patch and Sterling. It was extremely short-lived, however, and is not found in any subsequent Peterson catalogs. Whether it was slightly larger or smaller than the 406 and 407 is hard to say, especially when the 406 and 407 almost seem to be interchangeable. As mentioned above, earlier this year Peterson brought back the 406, a pleasing confirmation of Laudisi’s avowal to bring back some of the company’s vintage shapes. It’s only been out of production for about 20 years, but it’s nice to see it back. The first instance of the 406 I can find is in the 1947 shape chart. It reappears so consistently in subsequent catalogs that I don’t think it actually went out of production until around 1997. The new reboot is being made available across all the lines, as the initial release confirms—Aran, Donegal Rocky, Irish Made Army, Irish Silver Army, Natural Spigot / Silver Cap, Kildare, and Kildare Sterling. My personal favorite is probably the last of these, seen at the top of this post, not only for the length but the aesthetic and engineering of the P-Lip mouthpiece, which brings the roundness of the bowl to the button and will also give the seasoned Pete user the best smoking experience of the various lines. Could there be anything more Irish? Bowl Height: 1.31 in./33.27 mm. Chamber Depth: 1.00 in./25.40 mm. The 407 and 407 S/B entered the shape chart at the same time as the 406 in 1937, happily making its way along with its sibling until the 406 dropped out in 1997. The 407 has continued on as the sole “Prince” until just recently. Bowl Height: 1.29 in./32.77 mm. Chamber Depth: 1.08 in./27.43 mm. I didn’t use quotation marks, so the name isn’t Peterson’s, but my own. The 408 came into the shape chart in the 2nd edition Dublin-Era catalog (2000), when the 406 was dropped. It’s remained a consistent and well-beloved shape ever since, appearing in virtually every Classic Range line since its appearance in the Sterling line along the way, none more fetching than the meat-and-potatoes Aran pictured above. The 411, designated a “Ringed Bullcap,” is the only documented shape that has appeared so far (to me) predating the London-factory era. Seen above is the shape from Peterson’s German distributor issued in the mid-1920s. As other shapes on the tri-fold (one side of which is reproduced in the Peterson book) all bear familiar numbers, it seems safe to say that the “3913” number was in fact a Peterson catalog number for the shape. In any event, it appears in Peterson ephemera all the way to 1973. The 412, at least by Peterson’s reckoning, is not a Prince, but a Bullcap. It is first seen in the 1937 catalog, named in the 1947 and seems to have been in production until sometime after its final appearance in the 1965 catalog. 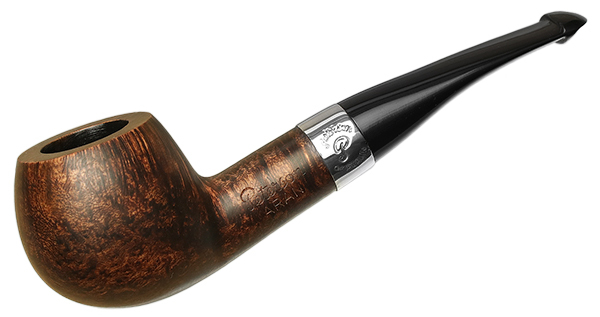 The 417 is the sole dublin entry in the shape group, and I’ve had personal experience with this one. 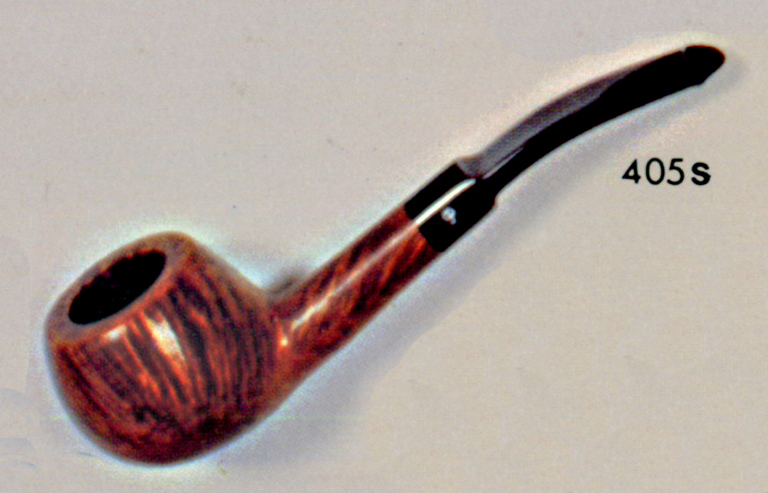 It received its official name in the 1955 European catalog—the “Long Dublin.” Like its larger siblings, the Long Dublin performs as a dublin should—bringing greater intensity to the flavors of the tobacco as the bowl is smoked down, needing fewer relights than the billiard u-shaped chamber, and so forth. 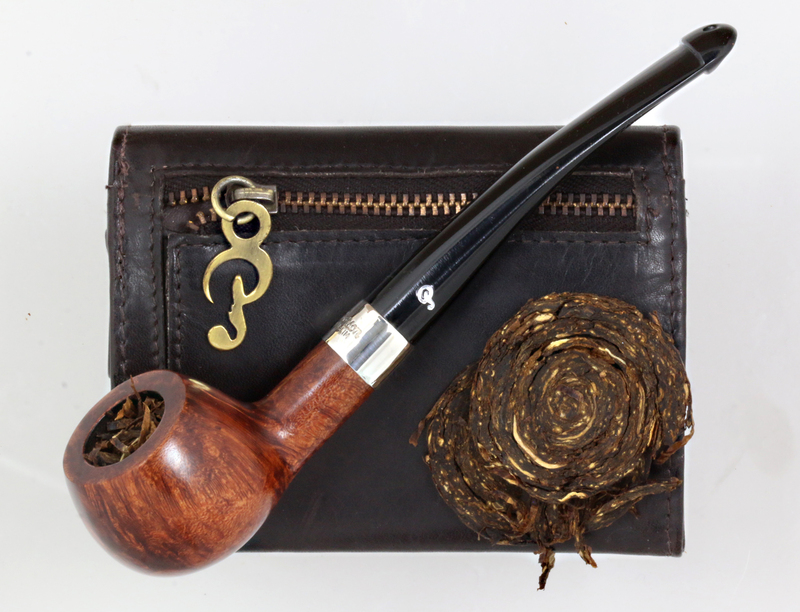 The shape is first seen in the 1937 catalog and then subsequently through 1979, although as I happened to companion a 1990 hallmarked Donegal Rocky 417, I know for a certainty that it was made at least through the early Dublin Era years. 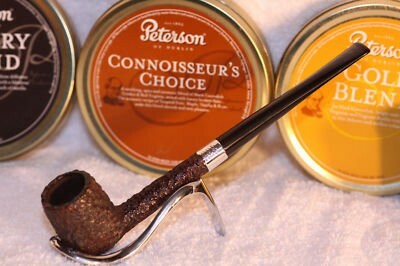 For its weight and size, the pipe packs a full-sized Peterson classic chamber. Outside Diameter: 1.22 in./30.99 mm. This shapes recalls one of those “you know you’re a pipeman when…” moments: when I find myself under a lot of stress, especially away from home, I have a nervous habit of looking at pipes on my smartphone. I have a few that were acquired during such moments—in the case of the 440, when I was sitting in the coffee shop at the hospital when my wife was undergoing surgery. I think if the anti-smokers understood just how much pipes mean and do for pipe smokers, they might relent just a little. The 440 shares its 1947-given name with the 450 (see below), but seems to have appeared earlier, being found in the 1937 catalog and then, while not often seen on the marketplace, continuing on in the catalogs to the present day. The Square Panel is seen only in the 1937 catalog. We have a photo of it in the book, and at some point, I remember one on the estate market from South Africa on which I bid and lost! It’s a smallish pipe as I recall, but bespeaks a calmer, saner, dare I say more “four square” era? 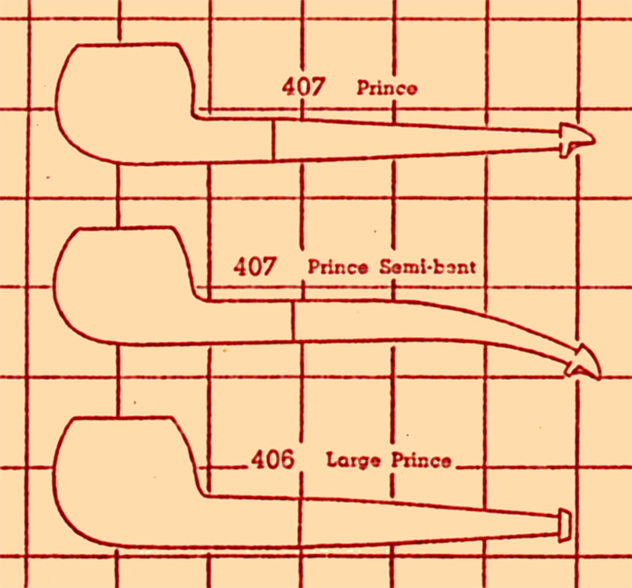 I love the name of this pipe (so-named in the 1947 shape chart): it’s so perfect because it’s so . . . l o n g . The shape is first seen in the 1937 catalog, named in the 1955, and for me, along with the serpentine oom-paul, seems iconic of the fringe-zootsuit zeitgeist of the 1940s pipeman, at least as portrayed in so many Hollywood films of the era. I suspect, from comparing it with the 440 in the 1937 catalog, that it’s about the same sized bowl, or perhaps even smaller. 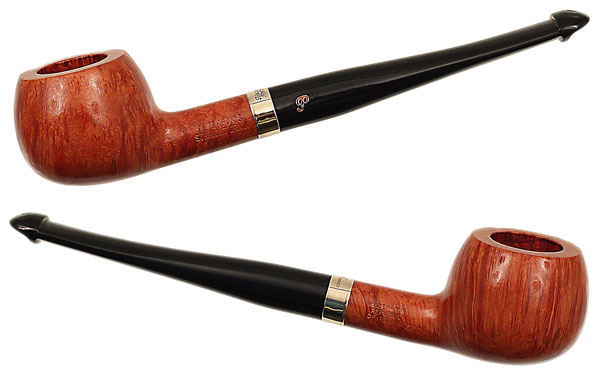 In any event, if I were to be in charge of Peterson reproductions, I’d make up some two-pipe companion case sets by decade, and for the early forties I’d issue one called ZOOT, containing a 445 and an 02BB. Very close to the 445 Long Pastime, maybe ¼ or a ½ inch longer, the 448 made its debut in the 1937 catalog and was never seen again. The 450 Long Billiard (named ’47 catalog) had a long production run, seen first in the 1937 catalog and last in the 1997, but still on the American market as late as 2008. Seen here are two examples. 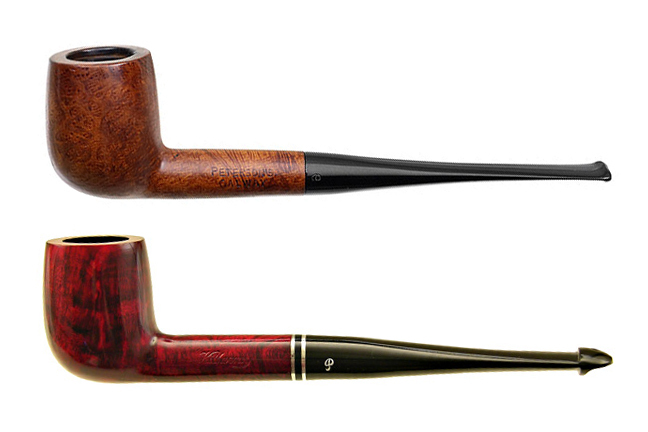 On top, the Galway high-grade version (only the Dublin & London and rarer Supreme were above it) from the 1950s, and on bottom, the entry-grade Killarney, from 2008. The 453 shares its 1947-given name with several other straight billiards, as you’re beginning to figure out: the 440, the 450 and seen below, the 455. Dating this one’s easy: it begins in 1937 and we have a clear DISCONTINUED stamp over it in the 1955 catalog. The 1955 catalog is also helpful in differentiating it from Peterson’s other billiards: notice the upward sweep of the shank as it converges onto the bowl, which is perfectly upright and lacks any forward cant. If I ever find one of these, I’ll think twice about passing it by. Here’s yet another Long Billiard, again seen first in the 1937 catalog and last in the 1955, as if this were the defining era for these “Bing”-type billiards. But in the 1940 catalog brochure, we see there’s some additional information. The contextual information on the complete page makes it clear that the 3” refers to the length of the stem and that with a shorter stem shape 25 becomes a 455. 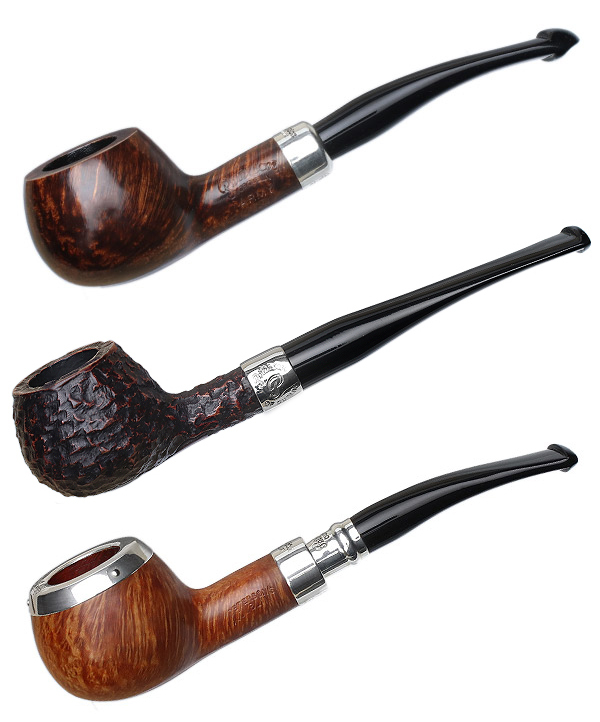 I can’t hardly imagine a time when a factory was making so many pipes that it had the need to make this kind of discrimination—certainly today Peterson sometimes has trouble just getting the right number (Classic Range or System) on a bowl. Named the “Long Apple” in the 1947 chart, the 458 appears in 1937 and like so many of the 400 group shapes continued until 1955. My copy of that catalog has a purple DISCONTINUED stamped across it, indicating that the shape had fallen out of production by the late 1950s. 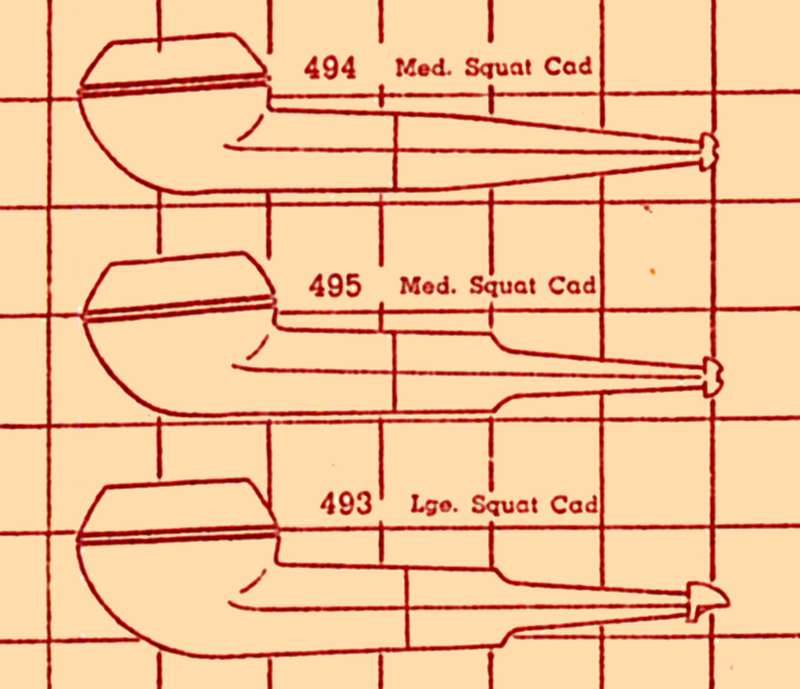 At least by its name, if not by the scale drawing seen above, the 493s should be the largest of the three Squat Cads, and it’s a honey of a pipe. First seen in the 1947 shape chart shown above, it continued in the catalogs until 1973. 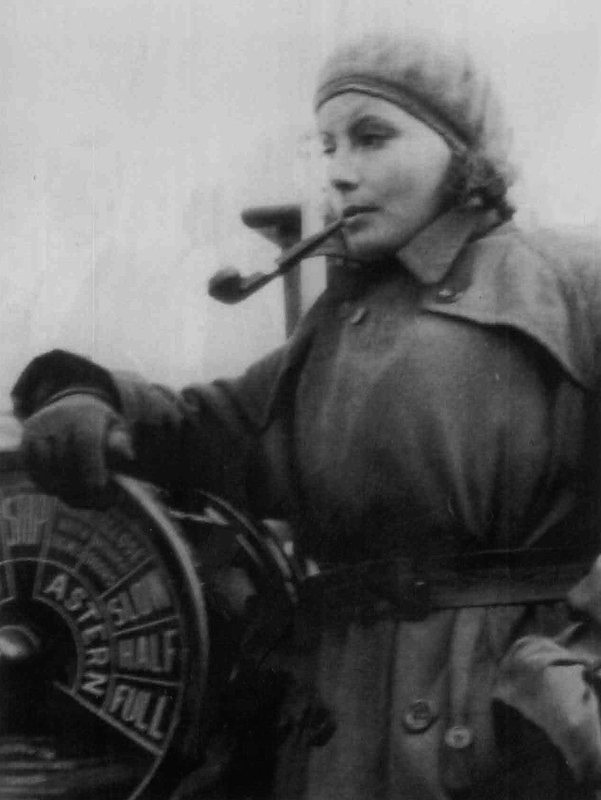 Knowing Dietrich’s flamboyant style and life-long love of tobacco as a method of weight control (and okay, undeniable sexual allure), I have no hesitation believing she did, on occasion, smoke a pipe. And now that the book is finished (and has arrived on US shores, word has it), I can give a little more sustained thought to Peterson’s shape groups. Dietrich’s 494 is first seen in the 1947 catalog and last seen in the 1955. So is there a difference between the 494 and 495 apart from the saddle stem? I’ll leave that for your consideration. It’s obvious that the 494 and 495 are smaller pipes than the 493, which isn’t itself very large by today’s standards.